It’s time to study for final exams! Are you ready? Whether you take your finals in December or later in January, the following tips are super relevant. Gretchen outlines 7 tips for how to plan and study for your finals, while saving time to have some fun too. Here’s the short version of Gretchen’s tips; tune into the podcast for more details about how to put them into action. 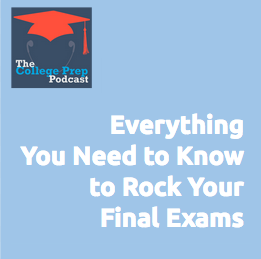 Map out your entire approach to final exams on one page, so you can see it all at once. Practice breaking down each final exam into actionable parts, so that you’re clear exactly what you need to do each day to study. Organize all your papers and supplies so that you locate notes, worksheets, and old tests that can serve as quizzable study tools. Study in the manner of the test, and plan backwards. Build in incentives so you follow through with your plan. Create clear study routines that are attached to a) things you already do or b) things you like doing. To get step by step guidance through this system, check out Gretchen’s Anti-Boring Approach to Powerful Studying.